Vermont has a tough row to hoe if it's going to make any meaningful difference in the state of an increasingly polluted Lake Champlain. Brian Shupe, Lori Fisher and Chris Killian speak at a press conference on the state's proposed TMDL plan on Wednesday afternoon. That was the word at the Statehouse Wednesday when Stephen Perkins, with the office of ecosystem protection in the federal Environmental Protection Agency, testified before lawmakers from nine different legislative committees. The legislators had gathered in a packed meeting room to hear the latest developments in a years-long effort to rewrite regulations aimed at reducing phosphorous pollution in Lake Champlain. Perkins had good news and bad news to share. The bad? Even if the state went "full bore" on its plan to clean up Lake Champlain, there are two sections — the Missisquoi Bay, and a section of the south lake — which would still see phosphorous levels deemed too high for healthy water. The good news? 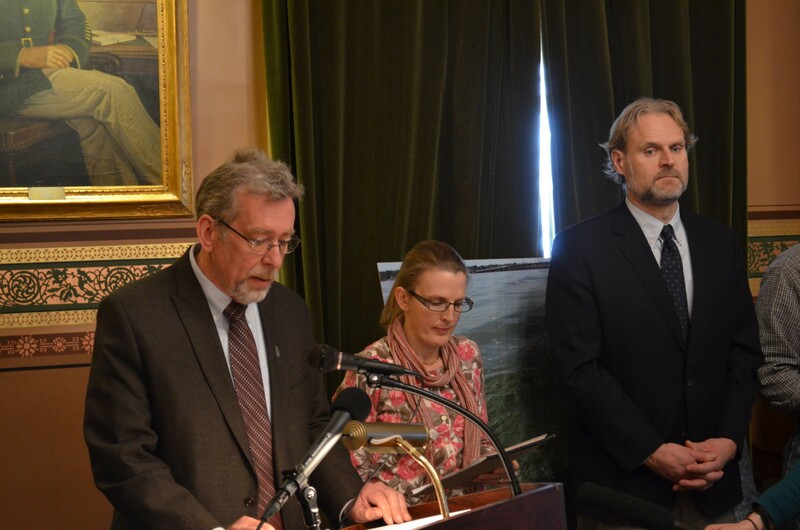 "In those remaining segments there's a prayer of getting there," Perkins said — but only if Vermont is aggressive in its approach to improving water quality in the years ahead. The EPA says Vermont needs to cut the amount of phosphorous it is dumping into Lake Champlain by 36 percent. It's been three years since the EPA revoked Vermont's former "TMDL" — or Total Maximum Daily Load — a technical standard for how much phosphorous the lake can safely absorb. The EPA stepped in to rewrite the TMDL and officials from the Agency of Natural Resources and the Agency of Agriculture collaborated with EPA on a plan to meet those goals. But now the EPA is pressing Vermont — hard — for more specifics on how it will meet the new target. Flashing graphs onto a large screen at the hearing, Department of Environmental Conservation Commissioner David Mears acknowledged that the trends are "discouraging." Phosphorous levels currently exceed healthy amounts in every portion of the lake. "This is doubly discouraging," Mears told lawmakers, "not just because we're not reaching our goals," but also because so much time and money have already been invested. Mears said scientists are beginning to notice some improvements in tributaries that feed into Lake Champlain, but those improvements take time to show up in the lake itself. So what's the state to do? Scientists at ANR and the ag agency spent the better part of last year drafting a proposal to bring Vermont's phosphorous pollution in line with the EPA's new target numbers. The focus is on so-called "nonpoint" sources — not a pipe that dumps into the lake, but rather diffuse sources of phosphorous such as croplands, streambank erosion and road runoff. Add stormwater treatment facilities in more densely populated areas. Now the EPA wants what Perkins called "reasonable assurances" that the state will translate these goals into action. There's a carrot in play: The EPA is set to issue the final TMDL by the end of the summer, which would put regulation squarely back in the state's hands. And a stick: If the EPA isn't convinced that the state is going to tackle nonpoint source pollution aggressively, the feds may intervene to clamp down on phosphorous flowing from wastewater treatment plants — which could be costly. Given the chance to pose questions to Mears and Perkins, lawmakers had plenty. What would the cleanup measures cost? Mears said his office is working on estimates. How will New York and Quebec factor in the discussion? Turns out, by a quirk of EPA district lines, New York's TMDL was never challenged in court in the same way Vermont's was, in 2008. While Perkins says New York will likely be watching closely to see how its neighbor to the east proceeds, the state isn't bound to make changes. "You folks are going to have to lead and we're all going to have to work to convince them to follow," said Perkins. And then there was this comment, from Rep. Tony Klein (D-East Montpelier): "We've been slipping on the problem." When, he wondered, would Vermonters start to see the worst case scenario: a dead lake? "I'm not ready to get to the place of hopelessness," replied Mears. When will the new TMDL standard — if adopted, as expected, at the end of the summer — start showing results? Perkins mentioned a 15-year timeline, but stressed that by going after bigger projects early on, the state could see significant improvement in the early years. Chris Killian, vice president and director of the Conservation Law Foundation in Vermont, took issue with the EPA timeline. "We're not on board with a 15-year timeframe," Killian said after the meeting wrapped up. "The time is now. The time was 20 years ago." He wants to see a plan, he said, with real specificity. But he'll have to wait a few more months to see if that materializes; the EPA has given Gov. Peter Shumlin until the end of April to issue a letter of commitment detailing the state's proposal. "We're hopeful, and we're placing our faith in Gov. Shumlin," said Killian. And soon, he said, he and other environmental advocates will know if that faith has been appropriately bestowed. Lake Champlain Is a Mess; Now Who's Going to Clean It Up?